eD@HoMe: An awesome cover from Kenya! 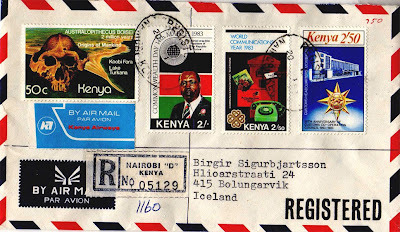 Today, I would like to share with you a registered cover sent from Kenya to Iceland. This was purchased on the eBay. 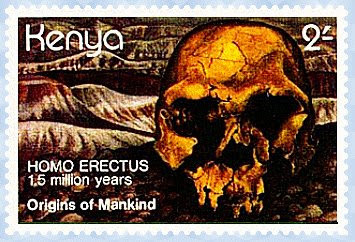 The skull stamp franked on the left of this cover belongs to the "Origins of Mankind" series, issued in 1982. 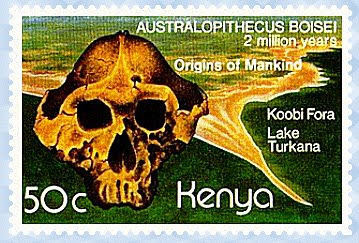 Homo erectus (1.5 million years ago), unlike Homo habilis and all of the Australopithecus species, ranged far beyond Africa. Some scientists have split Homo erectus into three separate species, based on the geographic region in which specimens have been found: Homo ergaster (Africa), Homo erectus (Asia), and Homo heidelbergensis (Europe). Generally, Homo erectus is characterized by large molars, an unpronounced chin, heavy brow ridges, and a long, low skull, relative to modern Homo sapiens. The skeleton of Homo erectus was heavier, or "more robust," than the average modern human skeleton. Body proportions vary greatly from individual to individual. "Turkana Boy" was tall and slender, like modern humans from the same area, while the few limb bones found of "Peking Man" indicate a shorter, sturdier build. 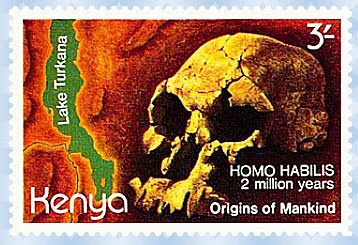 Homo habilis (2 million years ago) has been a controversial species since it was first described in the mid-1960s. 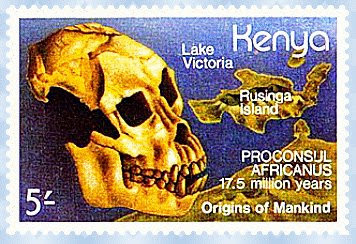 Originally, many scientists did not accept its validity, believing that all specimens should be assigned either to the genus Australopithecus or to Homo erectus. Today, Homo habilis is widely accepted as a species. The second stamp features Daniel arap Moi, ex-President of Kenya (1978-2002). 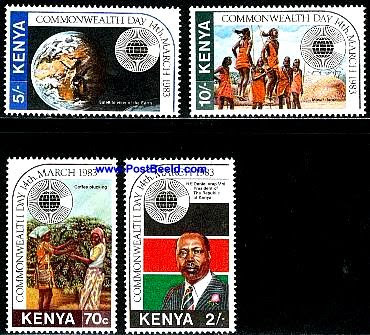 It belongs to a set of four stamps from the "Commonwealth Day" series, issued on 14th March 1983. Commonwealth Day is the annual celebration of the Commonwealth of Nations (An intergovernmental organisation of 53 independent member states. Most of them were formerly parts of the British Empire) held on the second Monday in March, and marked by a multi-faith service in Westminster Abbey, normally attended by Queen Elizabeth II, Head of the Commonwealth, with the Commonwealth Secretary-General and Commonwealth High Commissioners in London. The Queen delivers an address to the Commonwealth, broadcast throughout the world. While it has a certain official status, Commonwealth Day is not a public holiday in most Commonwealth countries and there is little public awareness of it. 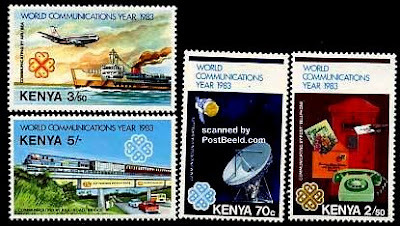 Next are 2 stamps to commemorate the "World Communications Year" and "30th Anniversary of Customs Co-operation Council" respectively. Both were issued in 1983.